St. Louis has big ideas for how to spend $50 million. They range from technologically advanced — such as LED street lights that also shoot video and transponders for cyclists to flip a traffic signal to green — to fulfilling long sought-after wish list items, such as a public bike-share. Microsoft co-founder Paul G. Allen’s company Vulcan Inc. will award up to $10 million for electric vehicles and funding ways to reduce carbon emissions. And Mobileye, a car technology company, will outfit the fleet of the winning city’s public bus system with driver-assistance safety technology. So it’s no surprise that competition is tough — St. Louis was among 77 cities to apply for the prize by the deadline earlier this month. “Operating an overbuilt road network continues to strain the city, economically and environmentally. Projects proposed for the Smart City Challenge promote a dense urban environment, and support an efficient system that serves our resident population, as well as our daytime population of nearly 500,000,” the city says in its application (about 320,000 people actually live in St. Louis). The entry touts the city’s small lots, short blocks and small setbacks as being the good bones necessary for a walkable, bikeable and transit-friendly transportation system. The grant outlines plans for a regional data center, which would collect and process transportation data to be used by several agencies and app developers. Agencies could decide what data they would share, and with whom. For instance, the city could use that data to identify the most congested intersections when prioritizing signal-timing projects. The city also proposed converting street and sidewalk lighting to “smart lights,” which are LEDs with sensor capabilities including video and the ability to do traffic counts, taking advantage of the city’s more than 60,000 light poles and fiber optic backbone. And, among other projects, it would use the money to begin a bike-share program with 500 bikes. Finding a funding source for such a program has remained elusive. The city also outlined a plan to create a bicycle corridor to improve signal coordination for those on bikes. Cyclists could apply for transponders that are detected by approaching signals, which would then give an expedited green light to the cyclist. Such signals would be able to communicate with and switch the light signal, for other vehicles often in a hurry. The grant would fund “connected vehicles” technology for 75 police cruisers, 25 fire department vehicles, 30 city maintenance vehicles and snowplows and an additional 20 Missouri Department of Transportation vehicles and plows in St. Louis. Such vehicles could even share information about the location of potholes. That technology could extend to buses as well, said Deanna Venker, the city’s traffic commissioner, who spearheaded the agencies, universities and departments that came up with the projects outlined in the grant application. 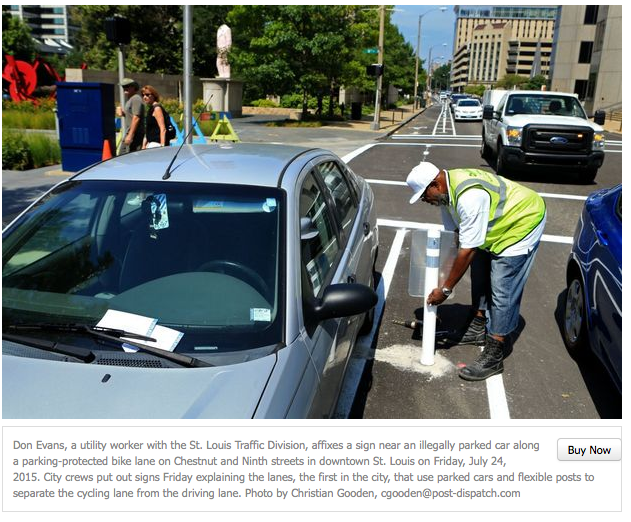 And what is the fate of such projects if St. Louis doesn’t win the $50 million? “Without it, it’s one grant at a time,” said Venker — a process that would take many years. It’s unknown how St. Louis stacks up against other cities in the competition. The Department of Transportation said it could not share applications. St. Louis provided a copy of its entry to the Post-Dispatch. The five finalists will be announced at the South by Southwest music festival in Austin, Texas, on March 12. Each finalist city will get $100,000 to hone their proposals and develop applications for the final selection process, which is set for June.